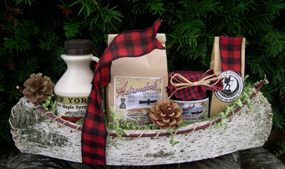 Our Adirondack Gift Baskets & Crates can be customized to fit your needs. Let us know what you would like and we will work with you. If you are looking for a quantity for office or corporate gifts, please let us know anytime. We can do our best given some time and your required ship date. Feel free to contact us at info@adirondackcountrystore.com or by phone at 800-566-6235.